WARNING: This is a preview of Yōkai City of Crime. All components and rules are prototype and subject to change. Rules and Setup: Fresh off the streets, the gangsters lay in wait of the perfect opportunity to become the kings of the city. To bring their family honor, each gangster moves through the city districts, doing the boss's dirty work and collecting reputation points until they are at the very top (or at least to 12). To set up the cityscape, shuffle each board tile excluding the largest named jail. Place one tile as the center, arrange the rest around it, and place the jail at the very bottom. Next, shuffle the city and intrigue cards separately, and create a pile for each. Have each player select their gangster, and collect the corresponding communicator and reputation counter. Then, each player places their reputation counter at 0 on the reputation track. Deal each player two intrigue cards and one credit token, and get ready for the first turn. Theme and Mechanics: Yōkai is set in a futuristic Japanese-esque city where gangsters rule the streets. The police seem to always be one step behind, or be controlled by rival gangsters, and raids are a nightly occurrence. 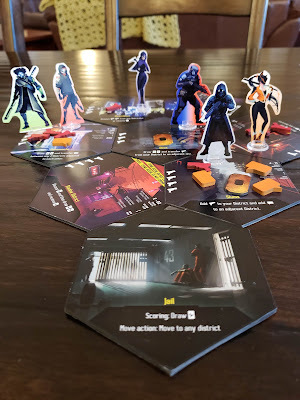 Game play focuses on several mechanics, including controlling districts, variable turn order, and simultaneous action selection across all players. The game also features a modular board which changes each time a new game begins, as the board tiles are randomly shuffled. 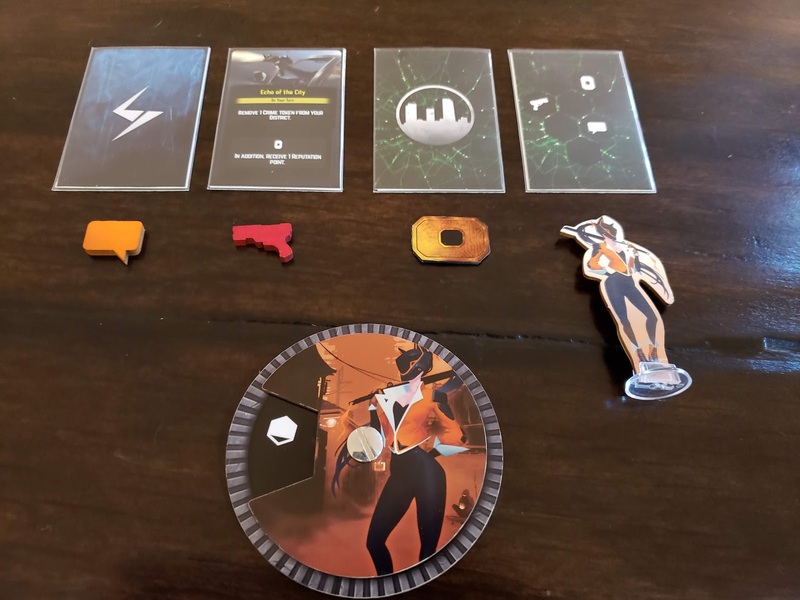 Game Play: Flip the first card in the city deck, and place crime, tip-off, and credit tokens as indicated to begin a new turn; this is the city phase. Next comes the action phase, which is completed twice. Each player selects an action on their communicator, flips it over, and then reveals it and performs the action according to their order on the reputation track. An intrigue card can also be played instead of choosing an action if it is an 'Instead of Action' card. 'On Your Turn' cards can be played after an action, but before the next player's action begins, and any number of these cards can be played during the turn. Move--you move your Gangster pawn to an adjacent District (or to any if in Prison) and then add a Crime token there, if possible. Increase Crime--add a Crime token to your District or an adjacent one. Tip-off--add a Tip-off token in any District. District action--perform the action written on the District tile in which you are located. Additionally, you cannot add any tokens or move to the Prison or the District with the Police pawn during the Action phase. Third is the police phase, where the police raid the District with the highest combined total of Tip-off and crime tokens. If there is a tie, the district with the most crime tokens will be raided. In the event that there are no crime tokens, the District containing the most Tip-off tokens is raided, and in the case of a tie the location with the gangster who has the highest reputation will be raided. Once the police pawn is placed on the raided District, all tokens are removed from the location and any gangsters in the District are sent to jail. 'Raid' intrigue cards can be played by all players during this phase. Finally, the reputation phase sees players gain points on the reputation track. First, all Tip-off tokens are removed from the board. Next, each player (in reputation track order) checks to see if they receive any reputation points. If a player is alone in their District, they receive as many reputation points as there are crime tokens, and receive any and all credit tokens. 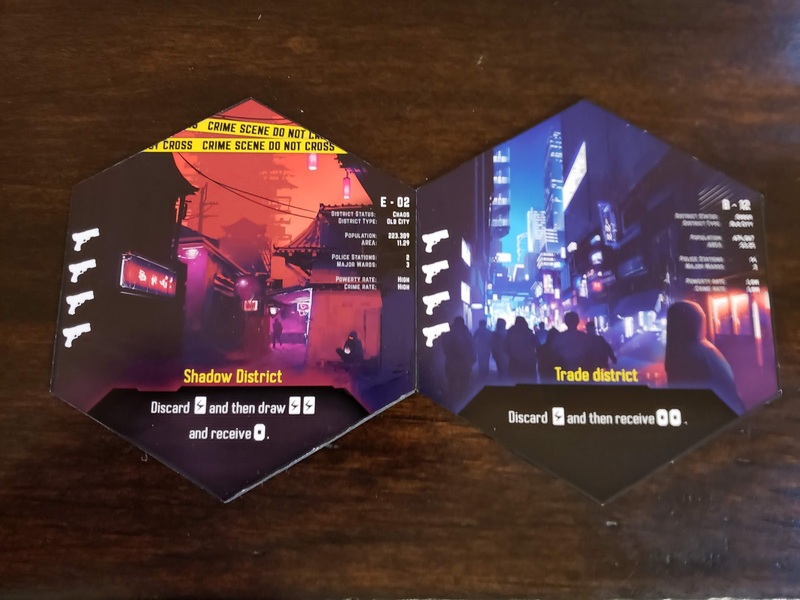 If there are other players in the district, each player gets as many reputation points as there are crime tokens divided by the number of players in the District, rounding down. Credit tokens are distributed equally between the players, leaving the remainder (if any) in the District. If a player ends their turn in jail, they draw one intrigue card. Any 'Scoring' intrigue cards can be played during the reputation phase. The game ends when one gangster reaches twelve points on the reputation track. If more than one gangster is tied to be the winner, the one who has the most credit tokens wins. Additionally, as a game variant, the District tile that the police pawn is on can be flipped to the Chaos side (the one with police tape), if it has not yet been flipped during the game. This provides new District actions for players as each tile flips to Chaos. During my play-testing of the game, I ran into a few issues with the rules. First, the 'Jail' District is referred to in the rules as 'Prison'. This is a minor issue, but made things confusing when I first opened the game. Also, the rule book mentions a diagram to aid in setup, but doesn't include one. This was very difficult, as the 'Jail' District must be set in the right place for the City cards to function properly. Players during testing also had issues with the communicator spinner being so loose that a different action was displayed when they flipped to perform their action than the one they had chosen. Overall, game play is quick and engaging. The requirement that all players select their actions before knowing what the other players will select for their own turns allows the element of sabotage in to play. Not only is this incredibly on-theme for the game, but it also complicates turns and introduces a need for strategy. While flipping tiles to the Chaos side, and long-term strategy provided by simultaneous action selection do complicate game play, the game does not last for an overwhelming amount of time. 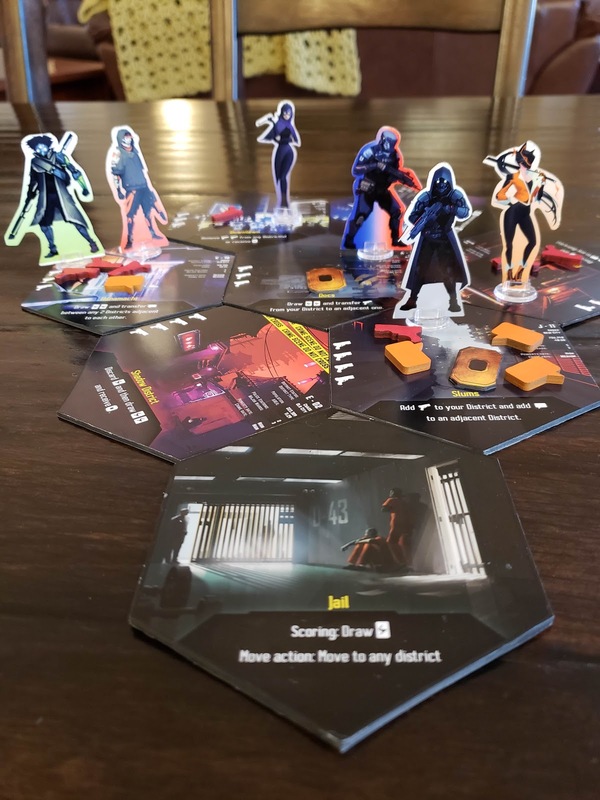 Each game is snappy, with each player's turn lasting under a minute, allowing players to stay engaged and continue to enjoy game play until a gangster is crowned the winner. 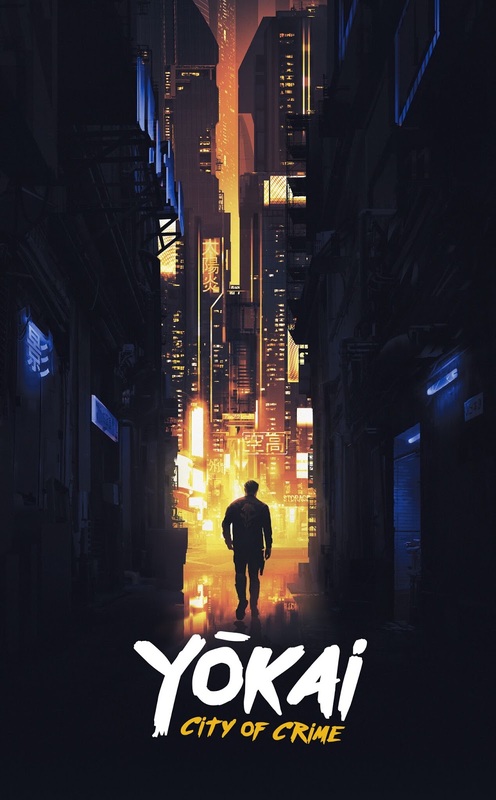 Artwork and Components: The artwork for the game is very stylized, with heavy influences from the Japanese Yakuza, manga art style, and science fiction android-esque masks. 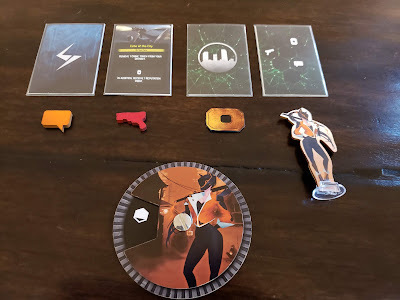 All components are made well, with the tokens being either wood or thick cardboard, and the communicators for each gangster being made of thick cardboard with an interesting screw spinner in the center. The District tiles are also made of thick cardboard, and interlock together well. Unfortunately, the screw on the communicator often comes loose during game play, or if turned the other way the screw tightens so much it is immovable. Additionally, an action marker was said to be included in the list of components, however this missing from the components I received. The Good: Game play is quick, interesting, and changes quite a bit throughout the duration of the game. Strategy increases throughout the game, as turns become more and more tense and players begin to really gun for their opponents. 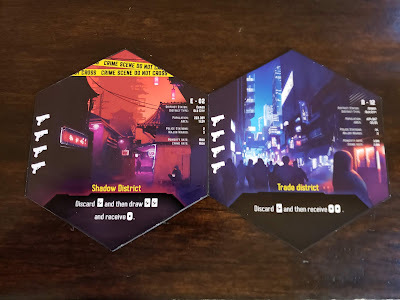 Also, due to the city cards and the potential to flip District tiles, each game is different and players will enjoy re-plays over and over without stale gameplay. The Bad: No mechanism for choosing the first turn order is explained. This is important, as turn order dictates quite a bit during game play. Additionally, the communicator's screw often comes loose or the spinner becomes too tight to select the action. 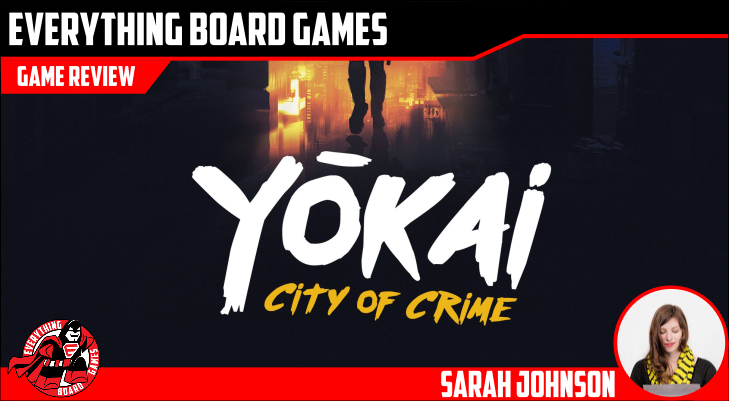 Final Thoughts: Yōkai City of Crime is an entertaining and innovative game, which stands the test of time to be re-played again and again without loosing its charm. With a few minor tweaks to the rules and components, it will be a real ten. 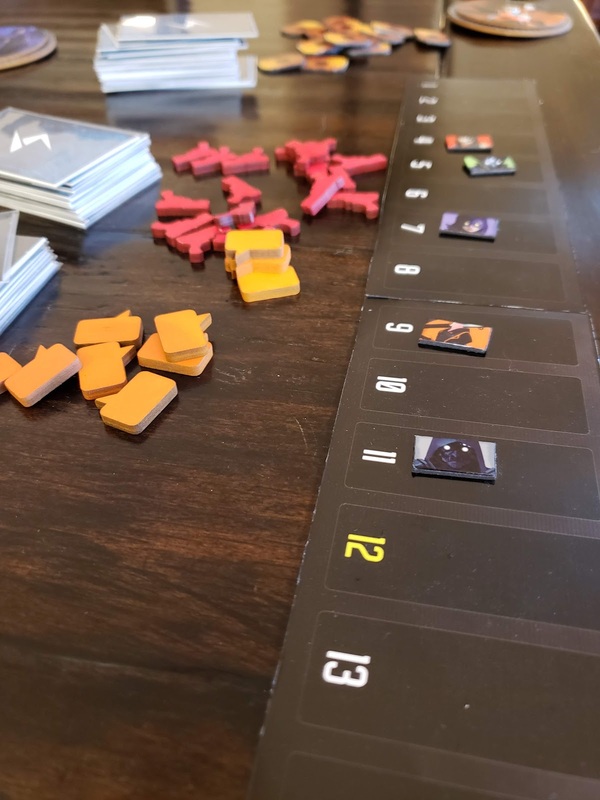 Players Who Like: Enthusiasts of Settlers of Catan, and Betrayal at House on the Hill will love this game's tile manipulation and player against player strategy. Sarah is a freelance writer and board game enthusiast. When she’s not playing games or writing reviews, she enjoys writing articles for food and wine magazines. Sarah lives in rainy Corvallis, Oregon where she studies writing, English, and communications.